Dean Dale A. Merrill and the College of the Arts invite students, alumni, supporters and community members to come “behind the scenes” and discover what makes the Clayes Performing Arts Center an amazing resource for arts students and audience members. Step into a variety of performance and rehearsal spaces where students will be showcasing their talents, join a backstage tour that highlights students’ work in our Scenic and Costume Shops, an art exhibition, refreshments, food trucksand more! See the schedule below! This is an event you won’t want to miss! Admission is $10 and includes a 4pm performance by the Fullerton Jazz Orchestra with guest artist Doc Severinsen and other invited guests including CSUF Theatre alumnus Marc Cherry. 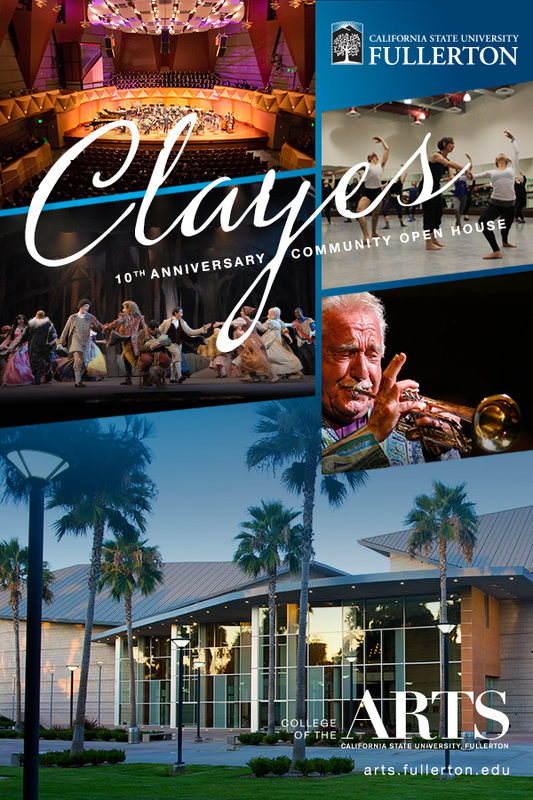 A conversation about the history of the Clayes Performing Arts Center, from A to Z. Guests will see what 5 tons of tuning looks like (aka “The Acoustic Canopy” that hangs in Meng Hall) from the unique perspective of the choir loft behind the stage. A look into the process of creating and designing theatre production cues which begin in a recording studio and are completed on stage.